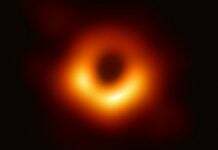 A mysterious, ghostly particle that slammed into Earth and lit up sensors buried deep beneath the south pole has been traced back to a distant galaxy that harbours an enormous spinning black hole. Astronomers detected the high-energy neutrino, a kind of subatomic particle, when it tore into the southern Indian Ocean near the coast of Antarctica and carried on until it struck an atomic nucleus in the Antarctic ice, sending more particles flying. The event, which took place on 22 September 2017, was captured by the IceCube experiment, a cubic kilometre of clear ice kitted out with sensors to detect such intergalactic incidents. Within a second of the particle being spotted, IceCube issued an automatic alert, prompting an international race to find the neutrino’s origin. Because scientists on the IceCube experiment had worked out the path the particle took through their subterranean ice instrument, astronomers knew where in the sky to look for the particle’s source. 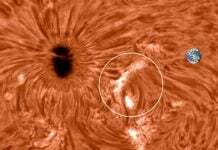 A string of early observations came up blank, but days later Nasa’s Fermi Gamma-ray Space Telescope spotted the likely source: a flaring “blazar”. The blazar that appears to have sent the neutrino our way lies 3.7bn light years from Earth, just off the left shoulder of the constellation of Orion. 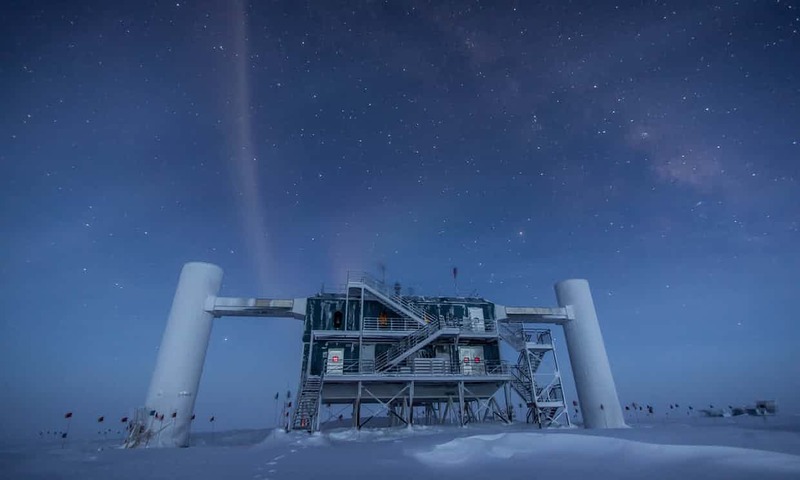 While a single detection is not strong evidence, the IceCube scientists went back through their records and found a flurry of neutrinos coming from the same spot over 150 days in 2014 and 2015. 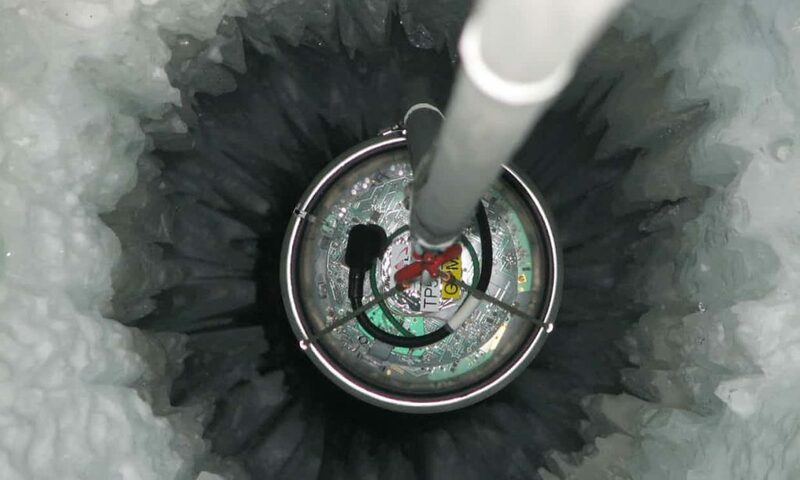 By discovering the neutrino’s origins, astronomers may also have solved the 100-year-old puzzle of what kinds of objects can create high-energy cosmic rays that occasionally hit the planet. Cosmic rays are made up of protons and other charged particles and are almost impossible to trace to their origins because the particles are deflected by magnetic fields as they travel through space. But high-energy cosmic rays also form neutrinos, which travel in straight lines so are easier to trace back to their source. In tracing the neutrino back to its origin, scientists have launched a new era of astronomy, one in which the heavens can be observed not only with traditional telescopes, and even gravitational wave observatories, but with neutrino detectors too. “How much we are just starting to scratch the surface is the big question we are grappling with now,” said Blaufuss. REUTERS – Colombia destroyed on Wednesday (July 11) the remains of a cable bridge that partially collapsed and killed 10 workers earlier this year. Ashtar Command is ready to rescue souls from the Earth in the event of catastrophes. Negativity of men attracts those catastrophes. There is a polar shift of the Earth in our generation. In this case, none can survive, and the evacuation is necessary. Asteroid collision in our magnetic field or the bypass of another large heavenly body (I guess just like Mars destroyed when the comet, Siding Spring that might be a large heavenly body = a huge mothership). This might cause the planet extinction. Tragedy of humanity would be unavoidable. 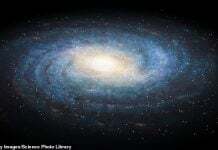 However, 35million members of intergalactic members will lift you up and rescue you to safety. Nice cover story…there is a brown dwarf coming at us from the south and that is the most likely culprit.